Many church folk fret over the lack of involvement of 20-somethings in their congregations. It is a difficult thing, and there are a handful of books written in the last year or so about young adults and their frustration with their churches. Some have had less than meaningful experiences in evangelical churches; others write from the perspective of mainline denominational parishes. It is something that older church leaders should be talking and praying and thinking and listening about; younger friends, I hope, will refuse to grow jaded or cynical or disengaged. Congregations that are near college campuses have a unique opportunity to think through ways to welcome college students into their family of faith, and today I was with a church in State College PA that has a history of involvement with the academic community, students, faculty, staff and friends. It is vibrant and youthful, and it was a delight to see older women helping to organize an event for younger students. From the excellent food to the art and ambiance, it was obvious that they were thoughtful about what they were doing (in a fairly standard-issue Protestant building.) Kudos to them for their hospitality and desire to be an outpost of God’s reign among the academic community, and their eager welcome of rowdy young folk. The event was called Faith4Thought, and I view it as a real privilege to speak and sell books at their conference. I’ve written before about their themes–and the much larger, February Jubilee conference in Pittsburgh to which it points. Relating faith and academic studies, helping professionals learn that God cares about their callings, cares and careers, equipping people live out their faith in the marketplace is a theological obligation, and we are thrilled anytime a local churches raises up this vision of cultural engagement and intellectual growth. When, like Calvary in State College, they do with and for young adults, it is spectacular and illustrates a key to building bridges with many young adults: speaking to these areas that are so important to this generation. I just had a blast—I talked to many about good books and preached my little heart out. Being located in a college town, or near a community college, art school or technical institute, does not guarantee that a church will attract young adults. It is odd to be, though, that many don’t even try. Many grumble about the “missing” youth and younger adults, yet don’t seem to have much energy or funds for doing anything about, even when there are hundreds (or, more likely, thousands, near them at these campuses.) Let us tell you about one organization that can help, an organization that co-sponsored the Faith4Thought gathering today. The CCO (Coalition for Christian Outreach) partners with local churches near colleges with trained staff to help those churches design plans for reaching, serving, ministering to and perhaps attracting student. We think that they are on to three big things. 1. Unlike other para-church groups, they don’t just show up on a campus to build relationships with young adults, starting Bible studies and social justice projects and such; they get stationed at a local congregation which has some kind of heart for student outreach, wants to attract and serve young adults, and wants to be involved in the academic institutions that are their neighbors. CCO is robustly ecumenical in a sturdy inter-denominational way, and they have staff at Episcopal, United Methodist, Presbyterian (USA) and other mainline churches, as well as at CMA, Evangelical Free, PCA, independent and other evangelical churches throughout the Mid-Atlantic. We applaud their inter-denominational approach because it is rooted in a solid ecclesiology. That is, they love the church, they think that ministry should be connected to local congregations, and they think that if we are going to help young adults relate faith and life, one part of that is getting them involved in the ordinary life or real congregations. Church camp, Cursillo, or Passion conferences only go so far, and young adults, like everybody else, need to be committed to the community of faith expressed in a multi-generational congregation. CCO gets this. Hosting an event for students on “academic discipleship” and the vocation of being students in a local church is extraordinary and right. God cares about college students, but so should the local church. To do that, the local church has to show intentional interest in the things that collegiates are about. 2. CCO also understands that if we are to make a difference for God’s Kingdom, we must commit to the long-term work of being Christ’s people in a particular place. Standing in and with a local church roots us, often, in a style and context of ministry that goes back hundreds of years in the same building! That is, by partnering with the local church, CCO is contextualized into a place, and wants to work within traditional institutions. Partnering with the local church near the local college is a way to make a longer-term commitment to a neighborhood or town or region. It is what some of us call a theology of place. The CCO holds out a vision of not just touching the lives of young adults who are college students, through the local church, but realizes that doing ministry like this allows for the nurturing of networks of influence that may lead to social initiatives, cultural reforms, institutional change. It seems that the theological perspective of the CCO that includes notions of the Lordship of Christ over all of life, themes of vocation and calling, an emphasis on the imagination and a Christianly shaped worldview, and the importance of both evangelism and social action leads naturally to caring about institutions. Locating a ministry out of a church for the sake of the local college shows a seriousness about culture-making and social change that is important. It isn’t really surprising that some CCO staff have also started or partnered with other local institutions as a platform for doing college ministry; they have become employed at colleges themselves, at local coffeeshops, or have been hired by Habitat for Humanity. Very cool. ar their college town. It was exciting to see young adults and older folk together tearing down tables and scarfing pizza as they moved out my book display and prepared for an ancient-future type meal and communion service they hold every Saturday night, for young and old alike. It isn’t easy to do the kind of work that will make a church interesting and helpful to serious young adults, but it can be done. So, CCO partners with churches, which illustrates their ecumenical, orthodox ecclesiology. They have a perspective on faith that believes that institutions are part of God’s created order and part of Christ’s redemptive work, so it is natural they care about local congregations, local people, networks of influence within the local academic community and beyond. And they intuit that young adults want this kind of stuff: robust, evangelical faith applied in innovative and missional ways, committed to big dreams of Kingdom outreach, including discerning vocation and callings. My speaking and bookselling at Faith4Thought reminded me not only of the stuff the event was about–the big themes of calling and career and relating faith and learning for the sake of God’s Kingdom–but the broader backstory of local churches and the faith development of young adults. 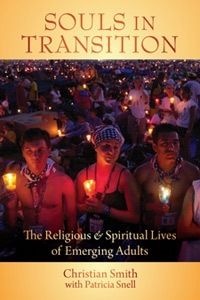 I suppose not everyone needs to read the serious research on the spirituality of American young adults, but the very prestigious sociological work of Christian Smith & Patricia Snell has finally come out, entitled Souls in Transition: The Religious and Spiritual Lives of Emerging Adults (Oxford University Press; $24.95.) This is the long awaited result of the five-year study following up the work done in his much-discussed Soul-Searching. Still, if anyone wonders why the young adults and college age are not so present in their congregations, and wants to really know the data or their religious views, this is will be known as the classic go-to volume. I commend it to those who care about young adults, who work with young adults, or with those who want a fabulous example of solid sociological work done by deeply Christian scholars who are at the top of their craft. Tribal Church: Ministering to the Missing Generation Carol Howard Merritt (Alban Institute) $17.00 This is the best book on this topic written by a mainline denominational pastor. It is loaded with astute observations, personal stories, and the latest research. She opens with a story about a Persian rug, connecting places she’s lived, itself an anecdote that speaks volumes… Very impressive, even if I may disagree with bits and pieces of her approach, and wish she would have addresses some things that were left out. Future Church Sara Wenger Shenk (Herald Press) $14.99 Sara Shenk is a fine writer, a Mennonite with her hear and heart open to twenty-something, voices that are themselves well worth reading and hearing. As Brian McLaren says in the forward “Presbyterians, Catholics, Pentecostals, Episcopalians, and others will feel that these Mennonite stores, with a few small adjustments, could be their own…” For what it is worth, one can tell that the researchers in this huge project were inspired by the work of Sharon Parks (whose book Big Questions Worthy Dreams is one of the best on this age group.) It also cites Steve Garber’s Fabric of Faithfulness on the first page. Yay. Quitting Church: Why the Faithful and Fleeing and What to Do About It Julia Duin (Baker) $12.99 Duin is a religion editor at a major newspaper and has her journalistic chops down pat. This is well researched, well told, interesting and yet very, very thought provoking. She admits she is in many ways a part of this story, and it makes a clear point that many folks (including the younger generations) find church boring not because of dry doctrine or dogma, but because of the lack of it. That is, she has uncovered this massive movement of those who have become bored by congregations that don’t challenge them, don’t teach much, aren’t particularly serious about faith, creeds or culture. I think it is a must-read for anyone wondering about how to engage younger adults. Dan Kimball (Zondervan) $18.99 Kimball is an easy to read and one of the more traditional authors in the emerging conversation, and this is a standard study of the attitudes of those who may be “spiritual but not religious.” Pretty fun stuff. There is a DVD, too, for those who want to be more welcoming, inviting younger jaded ones into conversations about faith. It isn’t rocket science, really, but this is a provocative way to enter the conversation and get others thinking about reaching this population. 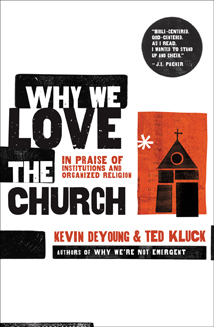 Why We Love the Church: In Praise of Institutions and Organized Religion Kevin DeYoung & Ted Kluck (Moody) $14.99 This is a hoot of a book, a bit snarky, pretty hip, and yet is a conservative, theologically rich account of these young dudes and their passion for Bible-centered, God-centered congregational life. Woot. Here is the book’s website where there is a video clip, a sample chapter and free study guide. Check it out and swing back here to place an order at our special price for blog readers. Great list Byron! Thought you’d be amused that this morning I responded to Ellen’s (one of my nine year old twins) question about whether there are any books which she’ll find of interest in reading when she grows up by explaining the significance of the book in hand. And that book was “Souls in Transition.” With the few minutes I had, I focused upon the myths of 1. “religious lives of young adults as a ‘black hole'” (p.282-3) and 2. “parents of teenagers are irrelevant” (p.284). We made a time line of the break of relationship which occurs between many teenagers/parents, ’emerging young adulthood,’ and the ‘black hole.’ I contrasted this with the illustration of our family’s commitment to intergenerational following of Christ and how our walk through stretching times of change are brought into focus by the lens of Christ. Furthermore, how the light of Christ shining through us as a family and individuals is a witness to our peers groups. PS. Wish I could have made the conference this weekend, it looked great. Would love to read more of your thoughts on this topic. Tom, this is just a fabulous, fabulous story. You’ve made my day, and it is a beautiful example of teaching children in natural ways. Yay. Hey Byron thanks for being a part of faith4thot. Erica gave me a great report of the day. Wish I could’ve been there… but glad it was a good day!